These are the 19 wonderful people who are responsible for the reconstruction of the verb conjugation charts of Biigtigong’s dialect of Nishnaabemwin. We are deeply grateful for all that they have made possible for our language and for our future generations of speakers of our Biigtigong dialect! Mabel’s contributions to the reconstruction of our language has resulted in the successful completion of our verb charts. Mabel pondered the questions asked and provided her insights after careful consideration. She understood the importance of working together and that everyone had something to contribute. Her beautiful laugh reminded us of the importance of laughter, especially when the tasks at hand were challenging. Mabel is part of the great legacy that is being built to ensure our children experience life through the eyes of Biigtigong Nishnaabemwin. Pauline’s playful spirit was always present as she helped with the reconstruction of Biigtigong Nishnaabemwin. Her positive energy and willingness to contribute has had a profound impact on the success of the project. Pauline willingly shared the language she carries and also provided constant support and encouragement. She was very mindful of the fact that every little piece counts and that together we could accomplish our goals. Always with a smile, Margaret happily participated in the construction of Biigtigong’s verb charts. Understanding her role as an elder and language carrier, she embraced the opportunity to contribute to our efforts to bring our language back to the center of our lives. She actively engaged in the discussions and provided positive energy. Margaret’s assistance in the reconstruction of Biigtigong Nishnaabemwin is a gift left for generations to come. With her gentle and thoughtful manner, Nancy provided the reconstruction team with valuable language information and insights. With careful deliberation and constant reference to her parents and grandparents, Nancy generously shared her language knowledge. Her contributions to the reconstruction work allows her to continuously be part of the language acquisition paths of our future children. The language spoken by her grandparents has been documented and will remain alive and well. Collette’s love for all things Nishnaabe guided her participation in the language revitalization efforts of Biigtigong. Always willing to give back to her people, Collette shared her language knowledge with anyone who was wanting Nishnaabemwin in their lives. Her love for our children and our future as Nishnnabeg is at the heart of Collette’s being. With this love, she always gives unconditionally and is always thinking about our responsibility to our future generations and to our ancestors. Collette understands the importance of having language alive and well in our lives, as it carries our Nishnaabe ways of seeing our world. Caroline’s love for our language stood in the forefront of our reconstruction efforts. Always willing to participate and contribute, Caroline’s understanding of the importance of language to our identity as Nishnaabeg was contagious. She keenly shared her language knowledge and demonstrated her desire to learn from others. Having a strong sense of community, Caroline actively contributes to the development and growth of our children. Helping leave a language legacy for the generations to come remains one of Caroline’s life purposes. Irene has witnessed the decline of language throughout Nishnaabe country as a result of her travels. As such, she understands the importance of language carriers helping to ensure our language is not lost. With passion and heart, Irene has always made herself available to help in the reconstruction work of Biigtigong Nishnaabemwin. Understanding the importance of the language to our well-being, Irene provided the project with audio-recorded reference material. Her on-going contributions and dedication will forever be valued and appreciated. Thelma’s knowledge of Biigtigong Nishnaabemwin can be attributed to her father Louis Goodchild and her husband Lambert Nabigon. Thelma readily made herself available to answer questions relating to Biigtigong’s dialect. She eagerly participated in the reconstruction efforts and understood the importance of saving our dialect of Nishnaabemwin. Her love for her community and our language provided the motivation to assist in our reconstruction work. Her contributions will be forever appreciated and valued. Lina always brought an excitement with her, as she helped in our efforts to reconstruct our dialect. Always with a spirit of curiosity, Lina sought to understand the project and gain a broader perspective. In her efforts to gain more knowledge, Lina constantly gave back the gifts of the language which she carried. She was always willing to share and did so unconditionally. Her excitement for the dream of seeing our language alive and well provided inspiration and hope. Alvina made herself available 24/7 to provide assistance on this project. She was always willing to help and to share what she carries. Willing to take risks, Alvina enthusiastically utilized her skills, to have the language being heard within the community. Always trying her best, Alvina actively engaged others in encouraging them to pass on what they carried. As a huge advocate for the well-being of our people, Alvina promotes Nishnaabemwin as a central component to achieving our goals. Alvina is always prepared to contribute and provide assistance in developing Biigtigong and Biigtigong Nishnaabemwin. Proddy strongly communicates his message that we need our language to be able to truly call ourselves Nishnaabeg. As a first speaker of the language, he understands what the language contains and what we lose if our language is left to die. Committed to the pursuit of our Nishnaabe ways of life, Proddy was an active participant in the language reconstruction work. His recordings and participation at various events, provided invaluable resources that helped significantly in the reconstruction work. As an elder, Proddy understands his role and is constantly giving of his time and knowledge. Art’s understanding of the grammatical structure of the language has played a very significant role in the reconstruction work of the verb charts. His ability to comprehend the complexities of the reconstruction of our language has allowed Art to make major contributions to the project. Art’s critical thinking skills and his understanding of the philosophical and morphological makeup of the language have been extremely impactful. His appreciation for his ability to see the world through the lenses of Nishnaabemwin is always communicated as he tries to instill the importance of language. Recognizing the vast range of dialects of Nishnaabemwin, Myra has been one of the biggest advocates for Biigtigong’s dialect. Working hard to save Biigtigong Nishnaabemwin, Myra has been a source of valuable language information which can be considered a pillar to our reconstruction work. Whether it was at the 50+ group meetings, meeting on the road, or her recordings or notes, she gave willingly to ensure Biigtigong Nishnaabemwin remains the language of Biigtigong. Like her father, Lawrence Desmoulin, Myra continues to be part of the great legacy to have our language be our source of life. As an individual who understands our language, Cecil speaks of the “mini-videos” that are contained inside each word of our language. Understanding the descriptive nature of our language, he constantly reminds us of the different expression of worldview. Wanting to help make a difference in the lives of the generations to come, Cecil was always prepared to help out. He embraced his limitations and shared everything he knew with pride and love for our Nishnaabe ways of being. Cecil’s motivation was knowing he did everything he could to help keep our language alive and well for our children and grandchildren. Arnold understood his limited knowledge of the language; however, he eagerly participated and shared what he carries. As a supporter of the language reconstruction project, he provided on-going support and encouragement. He often referred to our ancestors and shared stories of the times when Nishnaabemwin was the first language spoken in our homes. Arnold actively listened in various language discussions and expressed his willingness to learn and help create opportunities for our children to acquire their language. As a non-speaker of the language, Brian took the time to find out about the language reconstruction efforts in the community. Understanding the importance of language, he provided his support by participating in elder forums, where he gained a better understanding of the work being done. Brian sought to become informed and to find out where he could lend support in this initiative. He reminded us that there is a place, and that there exists a responsibility, for every person to be a part of this dream. Cindy has always been an advocate of language and has played a primary role in the revitalization efforts in the community. In her capacity as Education Director, she spearheaded the language revitalization efforts with the focus on immersion-based instruction. At the forefront of Cindy’s being is her conviction that language immersion is central as we work toward once again hearing our grandchildren speaking our language. Cindy understands the importance of language in our journey to reclaim our world and to walk as Nishnaabeg. Daryl was always willing to offer his support to the language reconstruction efforts, despite the limitations with his knowledge of the language. Daryl sought to provide support and share his language knowledge in the collective efforts of the community. He understood that we were putting together a big puzzle and he willingly provided some of the puzzle pieces he carried. 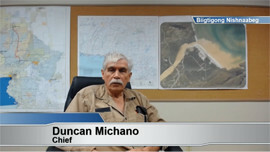 Daryl’s contributions helped in the successful documentation of Biigtigong Nishnaabemwin. Duncan understands and appreciates that language expresses the unique worldview of a people. He grasps that each language has a grammatical structure that is based on patterns and rules. Duncan recognizes the importance of the documentation and reconstruction work in our language revitalization efforts as our first step in creating speakers of Biigtigong Nishnaabemwin. Having a curiosity, Duncan expresses interest in the morphological makeup of our words and the expression of our worldview. He has been a major supporter of the language work and of creating a space to empower our people to take responsibility for our language.